PlayStation fans were only just teased by rumors stemming from Supremacy MMA s press release, which indicated a fall launch window for the PSV, but the rumor was squashed when 505 Games clarified it as simply speculation. Now, another bit of evidence for a fall release has sprung up in the UK. 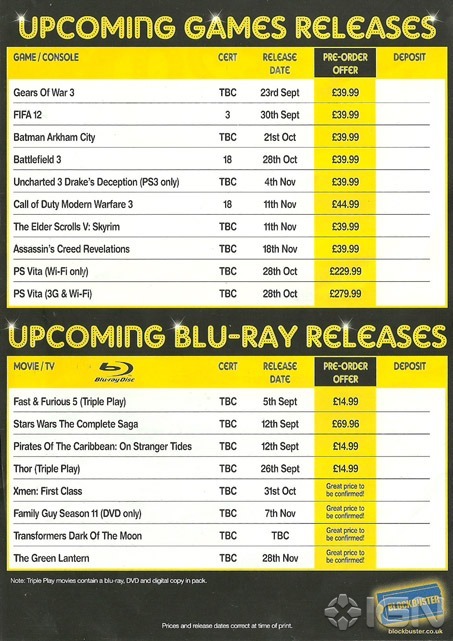 A blockbuster advertisement sent to IGN by one of the site’s readers indicates an October 28th release date for the PlayStation Vita. Whether or not the ad is actually authentic remains to be seen, but if it is, there is reason to believe that other territories including North America will see the game before 2012. It is worth noting that both models – 3G and Wi-fi only – are included in the listing. Sony has responded to the rumors by saying that the Vita will see a “phased global release” this holiday season. Whether or not that timeframe extends into next year has yet to be determined, but considering all the rumors that have been floating around and Sony’s track record for keeping secrets, gamers may just be able to get their hands on the system a bit sooner than expected.